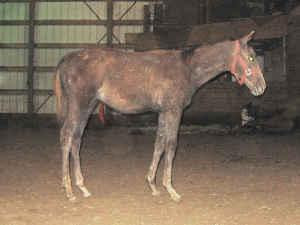 Fugly Horse of the Day: Blind as a barn bat! We've talked before about how so many people are just "barn blind." I.E. they might be able to see fugly in other people's horses - but their own? Their own are perfect and fabulous. If it's theirs, it's flawless! Today we're going to look at a couple of examples of overly enthusiastic advertising (and yes, I do think these are probably the same people who call themselves "attractive" in their online personal ads, even though they are 5'3, 250 lbs, and - to steal from Dave Barry - have 8 strands of graying hair which they comb over the top of their head so that, when viewed from above they look like an eggplant in the grip of a giant spider). "A nice colt that is everything we want these days except color. Sired by Painted R J Robin, superior western pleasure and honor roll horse, earner of over 500 WP points and the sire of the same and out of an elegant Thoroughbred mare. This is a nice big, quiet and pretty moving colt that is a quick learner with the great minds of his parents. Very quiet. Clips,loads,crossties. Should mature to around 16 hands plus and have the ability to do both English and Western. APHA Breeder's Trust eligible and breeding stocks show for free or at a substantially reduced rate at APHA shows. If he had color he wouldn't be for sale but sadly he doesn't fit my goals at this time. $800 "
OK. I'm sorry, but what? Painted R J Robin is a nice horse (though I suspect he doesn't have an ideal shoulder either from the pics I can find - can't find a side confo shot), but that Thoroughbred mare must be a conformational train wreck to have produced this roach backed, no hipped, clunk headed, scarily long pasterned colt. If this is "everything you want," you could have skipped breeding him yourself and gone straight to buying one just like him at a local sale for $50! 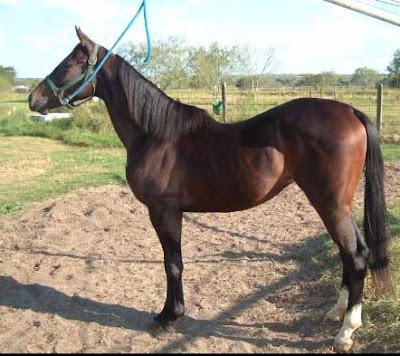 This is a 2 year old Thoroughbred colt who has had 30 days under saddle. Must have been one BIG saddle and with one of the residents of the Brookhaven Obesity Clinic on top of it! Of course he's still a stud, and they optimistic advertise him as a prospect for dressage, endurance, eventing, and racing. Now, he is a 2 year old, and he may level up some, but unless someone comes by with a magic wand to wave over him, I don't think we're ever going to have a topline here that holds up to any of the aforementioned disciplines! C'mon, people. Really. Geld it, and throw it out in the field for another year, and leave it alone, and then see what you've got. 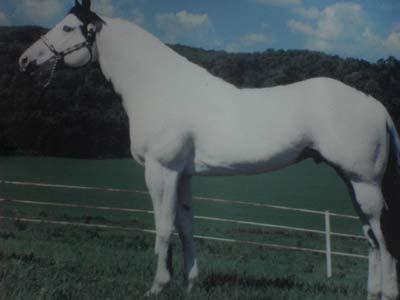 "ZIP IS A BEAUTIFUL STALLION. LOTS OF BEAUTIFUL BABYS"
OK, I will admit this is not a beautiful picture and any one of us could have done better...however, still, I don't care, this thing is just FUG. He's got a neck like an overfed Arab with Cushing's, I don't even know what to make of the odd withers, he's got the loin of a greyhound dog tying into a goose rump and he's so camped out I doubt he remembers what his hind end looks like. And they want - are ya ready - NINE THOUSAND DOLLARS FOR HIM. Yeeeek. He is a producer of point earners. All I can say is, he must throw better than he looks! As I always say, if you want to know if your horse is breeding quality, here's an idea: Take it to a few shows and see how it compares against its peers. If you're dead last every time, even though you think you've got a world-beater, the odds are you're suffering from chronic barn blindness!